Hamilton Pool is one of the best swimming holes in Texas - and a great place to picnic, swim, and spend some time on a hot Texas summer day. Make sure you also check Texas Outside's list of The Best Swimming Holes in Texas. 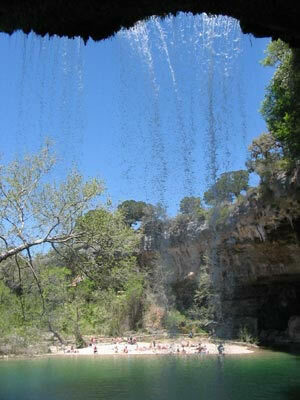 Access to Hamilton Pool is now by reservation only! For information regarding reservations please call (512) 854-PARK (7275) or visit the Hamilton Pool website reservation page. The preserve's pool and grotto were formed when the dome of an underground river collapsed due to massive erosion thousands of years ago. There is a 45 foot water fall creating a great swimming hole. You need to also hike some of the nature trails along the creek. Swimming is allowed only when the water quality meets safe standards. Water quality is monitored regularly. Updated information is posted at the entrance booth and provided on the park's telephone recorder message (512 264-2740). The parking lot is sized for 75 cars, and when all spaces are taken, cars are held up at the gate until a space opens. Drinking water or concessions are not available in the preserve; chemical toilets are provided. Pets are not allowed, even on leashes. Neither are visitors allowed to leave pets in cars while they hike and visit the water fall. Visitors to Hamilton Pool, please leave your pets at home for this excursion. 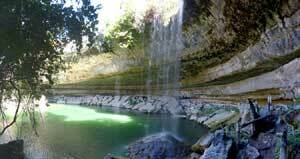 Extreme care is crucial for the delicate and beautiful ecosystem which forms the Hamilton Pool Preserve. Visitors are asked to please understand the necessary rules for preserving the park's unique beauty for generations to come. The well-marked hiking trail leads from the parking lot to Hamilton Creek. At the creek, the trail to the right goes to the pool and the trail to the left follows the creek downstream to the Pedernales River. Bald cypress trees, lush, diverse plant communities, and a variety of wildlife species occupy the grotto and downstream areas. The hike from the parking lot to the pool is about 1/2-mile round-trip; the hike along the creek from the pool to the river is about 3/4 mile, or l 1/2 miles round-trip from the parking lot. If you're looking for swimming holes, then you need to check out The Best Swimming Holes in Texas Page - make it a goal to try all of them. Check out a great local Austin SEO Company!